Chances are, you will witness a car accident at some point in your life. It may occur while driving on the road, walking on the road or even watching the road from your nearby home or workplace. If this happens, your only true responsibility is to call the authorities and let them know that an accident just took place. If you choose to take further action, you should know that once you involve yourself, there is no backing out of the situation. Of course, this isn’t to say that you shouldn’t attempt to help if you think you can. It’s just something to keep in mind. Your first and most important responsibility after witnessing a car accident is to dial 911. Always do this before you move toward the scene of the crash to check on the injured. If the injuries are severe, it will help to already be on the phone with a 911 operator so you can receive instructions on how to provide medical support. You also want to ensure that the ambulance is dispatched as soon as possible. Even if the accident appeared to be minor, always make the call. If nothing else, a police officer needs to be on scene to make a report. It’s great to want to be a hero, but endangering your own life while trying to save another could make the situation worse for everyone involved. 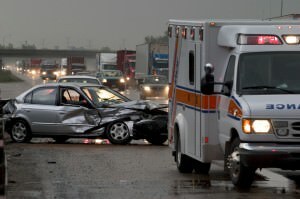 If you were to get hit by a car while trying to save another person, not only would it mess up your own life, but it would leave the rescue unit with even more injuries to deal with. If you feel that you can help, go ahead, but never do so at the expense of your own safety. Once you’re on the scene, it’s important to stay as calm as you can. Remain on the phone with the 911 operator until the authorities arrive and follow his or her instructions carefully. Unless you’ve been trained as a first responder, you should avoid attempting any medical treatments beyond what you’re instructed to do. If something were to go wrong and the injured party were to die, you could potentially be blamed. However, there are exceptions to this rule. For example, if the wrecked vehicle is on fire and the injured party is about to be burned, you should probably do everything in your power to get him or her out. In situations like this, it’s best to trust your gut and make a judgment call on what seems right. When the police arrive, remain on the scene until you’ve given a statement and been told it’s okay to leave. You’ve involved yourself as a witness, and now you need to follow through by discussing everything you saw in as much detail as you can remember. Always leave your name and telephone number with the officer so you can be reached later if necessary. Witnessing a car accident can be a scary experience, but it also presents you the opportunity to make a difference in another person’s life. Someone who has just been through a car accident will be terrified, confused and in need of compassion. If you’re brave enough to offer that help, he or she will likely remember you forever.